one American and one Swiss on the "Exploratory Expedition". They both had extensive adventure travel resumes. But, what they experienced was like nothing they had ever seen before. We flew by a charter plane into our starting point. The airfield is just mud and grass. We gathered up our porters and then headed out from there. We had around 20 porters because we expected to be out for around two weeks. We trekked for a few days and along the way we picked up 3 traditional warriors, who were clad in only a leaf covering their penises. There was one porter/guide who had spotted a man in the forest several months before and this is where we wanted to go. We set up camp along a small river. Our guide told us that on the other side of the river was another tribe's territory -- a territory where none of our porters had ever visited even though it is only a few days walk away from their village. This tribe still uses bone and and stone tools and has never seen a white skinned or Indonesian person. This new tribe, Waira is very territorial and outsiders are not welcome. If you want to see them, you have to go into their territory because they never leave the area. We proceded to make a basecamp there, cutting down trees and making a pondok (bush shelter) for our porters to sleep under. Then suddenly in the late afternoon we heard a group of men calling out from the other side of the river. Some of our porters huddled in the pondok, and others grabbed bows and arrows and ran down by the river to see who was there. Then all went silent and remained silent for another hour, when suddenly they were calling out again, but this time they were behind us, on the same side of the river as we were. Our guide, who is from a different tribe, said he could only understand a few words of what they were saying. But, he knows it isn't good. And now it's dark and we know that they are somewhere out there, and we can't see them. My guide and I discuss strategies on how we should deal with this potentially dangerous sitiuation. We decide that he should try to find their camp (village) and try to explain that we mean no harm and have gifts to give them. Two traditional naked warriors follow with him, just in case there is a problem. They proceed to walk about 2 minutes out of camp when suddenly the new tribe screams out and starts shooting arrows at our guide. He lies flat in the mud and then runs back to basecamp. He is visiably shaken, but decides to go back in another hour or so. He again leaves to find their location and two men go with him. He finds their camp (village) and yells out in the night to them. They come out of their huts and say that they will kill him. He tries to get them to understand we come in peace and have gifts. They tell him, to the best of what he can understand, that they will come back to our pondok (bush shelter) in the morning. And if we are there they won't be too happy. Needless to say it was a rather restless evening. Porters were on watch throughout the night and my clients and I woke up around 4 am. I immediately broke down our tents and we put most of our equipment inside the pondok. We all sat around waiting. It was just barely light out and the forest was alive with the sounds of insects and birds of paradise. It was a very eerie feeling, just waiting for them to come. How would they react to us? Would they attack us? Then suddenly out of nowhere, they started yelling out and charged into our camp. Half of the porters just took off running into the forest. They were scared to death. The other half plus our 3 traditional warriors stayed and in a weird show of force, our guys would run up to them and break their arrows as they tried to pull back on the bow. It was like a cross between some strange dance and a rugby scrum. My clients were standing in front of the pondok taking photos, as this might have been our only opportunity to get photos of them. I'm watching the situation and keeping an eye on the guys as they break arrows. Then suddenly the chief breaks through and comes running at us. I say to my clients, "Oh no, here they come." Two porters catch him and break his arrows as he is trying to pull back on his bow. We turn and start running in the opposite direction. After a few more minutes of struggling with them, they leave. And then about 20 minutes later they came back. We were all gathered inside the pondok or in front of it. They trashed our camp. Broke our plastic cups, smashed our pots and pans and filled our tarp with arrows. And just like that, they ran away into the forest. Our local guide told us that we should wait for a while and then try to follow the trail to their camp (village). We took with us about 6 porters and the 3 traditional warriors. All of our guys brought bows and arrows with them. We followed their trail and then it came out at a small clearing. There we could see where they live. There were 3 tall houses built in the trees and one long house on the ground. 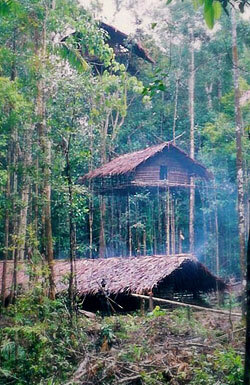 The houses rose up around 15 meters high and they looked like they were built next to or partially in the forest. The men, around 6 of them, were in strategic positions in the area under their houses. They were all armed with bows and arrows and ready to use them if need be. The chief yelled out and we took that as a warning to stop and not come any closer. We were about 60 meters from their camp. Our local guide tried to communicate to them that we brought them gifts and that we just wanted to see them and then we'll go. We brought them 2 metal axes, a carton of salt and a carton of shag (cut leaf tobacco). We showed it to them and left it where we were standing. As we left they shot arrows off to our left, in a show that they were the winners and had scared us off. We went directly to our pondok, gathered up our equipment, and then started our trek back to where we started. Our guide said that they would later come and destroy our pondok and every tree that we cut down to make a bridge accross the river. He said that if you make contact two or three more times with them, that they will probably let us enter their village and hopefully they can take us deeper into the jungle to see other people of their tribe. In 2006, I will lead another expedition to visit the Waira tribe. be like it was on the "Exploratory Expedition". Also in 2006, I will be leading another "Exploratory Expedition". It is scheduled for October 2006.